I have a granddaughter who is in love with anything animal, but especially the exotic kind. 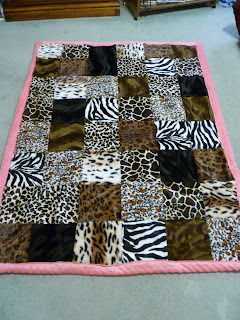 I decided to find several kinds of fur fabrics and make her a quilt for Christmas. I had never used this type of fabric before and don't know that I will again! It was really hard to sew and make sure that everything was straight and even and matched up, what with the different piles, etc. Some stretched more than others and some seemed very fragile. But I did it! I chose the hot pink backing as she also has a very definite feminine side. She is very tomboyish most of the time, but loves her dresses and pretty things also. I calculate this quilt to be about a two-yarder. Look at it from two yards away and it looks nice. Don't get too close to see the mistakes! :) Have a wonderful day, and as always, thanks for stopping by! i am in LOVE. and i happen to know a little girl who will love it, too. thanks so much for all your hard work- it was definitely worth it! I am a mom to two very handsome sons and step-mom to three sons and a daughter. I have three wonderful daughters-in-law and one son-in-law. I am a grandma to seven beautiful grandchildren. I was married to the love of my life for 23 1/2 years. I love to create "things" that I can give to others that will bring them joy, whether it be from paper, wood, glass, fabric, whatever! I love sharing my love for my Heavenly Father and His son, Jesus Christ with others. I live in Utah with most of my family. I love the mountains, but also the flat midwest plains. I love helping people in any way I can, within my power. I am rugged on the exterior, but a pushover on the inside...and my kids know it! I love being outside, but also love being curled up inside in front of a fire with a really good book. Colors amaze me, whether they be neon and bright, pastels, or deep, dark and rich. I believe you can see beauty in most everything if you look hard enough! Dates, Dates and More Dates! Is it time to plant a garden?